Fellow Linux/Windows dual-booters out there are familiar with this problem: you can access Windows files from your Linux session, but not the other way around. Saving humanity by chipping away at Windows' illogic is ExtFS for Windows, a handy utility from the Paragon Software Group that gives dual-boot users full read-write access to Linux partitions from their Windows session. ExtFS' drivers are based on Paragon's proprietary cross-platform Universal File System Driver (UFSD) technology, which provides a higher data transfer rate than native filesystem performance. 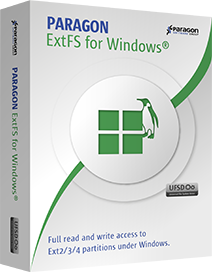 Paragon recently unveiled a new feature-rich version 4 of ExtFS for Windows, which comes with extended support for Ext4 file formats enabling the highest transfer speeds and mounts Linux volumes, including those more than 2TB in size, at up to twice the rate of the previous release. Thanks to the development of ExtFS, Paragon calls itself the first software developer to implement a full set of drivers with complete read and write access to partitions on all popular filesystems. ExtFS for Mac is also available from the company.